The Bharatiya Janata Party (BJP) has reacted angrily to the sting operation by Cobrapost on the Babri Masjid demolition, urging the Election Commission to issue an order against its broadcast. Addressing a press conference in the national capital on Friday, senior BJP leader Mukhtar Abbas Naqvi questioned the timing of the sting. 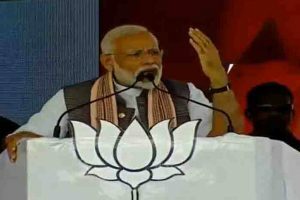 The BJP termed the sting as politically motivated and alleged that it was a meticulously planned operation to polarise the Lok Sabha elections. The BJP alleged that it was “sponsored”, accusing Congress of using “pawns” to vitiate the atmosphere before elections and asked the Election Commission to stop its publication and telecast. Writing to the Election Commission shortly before Cobrapost was to hold a press conference here, BJP sought a bar on its contents being made public. BJP spokesperson Mukhtar Abbas Naqvi said reports had appeared in papers today about a sting operation related to the sensitive Babri masjid-Ram Janambhoomi dispute. Through this “sponsored sting operation”, there is an attempt to inject poison in the peaceful and amicable election atmosphere in the country, he said.